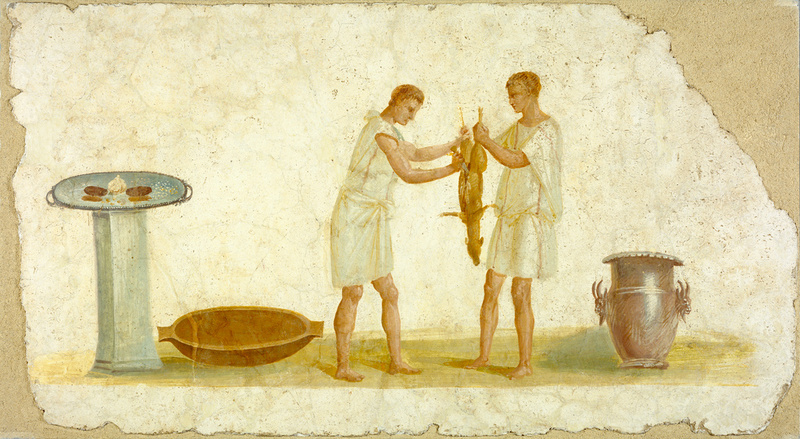 In this scene of domestic activity, two men prepare the carcass of a small, cloven-hoofed animal, perhaps a calf or fawn. The figure on the right grasps the feet of the animal while the man on the left slices into the belly with a wooden-handled knife. To the right is a large vessel with a scalloped rim and handles in the shape of goats’ heads. The sheen and color of the vessel indicate that it is made of silver. Vessels of this size and shape were used to dilute wine with water at dinner parties, suggesting that this scene relates to a festive occasion. Placed on a pillar to the left, a silver tray with a beaded edge and rounded handles holds garlic and other foodstuffs. A large wooden bowl rests on the floor. The bowl may be there to hold the cuts of meat sliced from the animal's body when the butchering is finished. The Roman banquet set the standard for extravagant dining. Course after course of rich and elaborate food was served as a statement of the host's wealth and social status. The vast extent of the Empire made many exotic ingredients available, and the use of expensive imported spices showed wealth. In most wealthy households, the kitchen help, even those with special skills like the cook, would have been slaves. The sort of scene from everyday life depicted in this wall fresco is rarely found in Roman villa decoration, and the fresco may have adorned a tavern rather than a home. Although there are no known parallels for paintings of this type of scene, reliefs depicting figures carving meat appear in tombs of butchers that date from the second century A.D.
Bank Leu, A.G. (Zurich, Switzerland), sold to the J. Paul Getty Museum, 1979. Dersin, Denise, et al., editors. What Life Was Like When Rome Ruled the World. Richmond, Virginia: Time-Life Books, 1997, pp. 62-63. The J. Paul Getty Museum Handbook of the Antiquities Collection (Los Angeles: 2002), p. 218. Spivey, Nigel and Squire, Michael. Panorama of the Classical World (Los Angeles: Getty Publications, 2004), p. 65, fig. 102. The J. Paul Getty Museum Handbook of the Antiquities Collection. Rev. ed. (Los Angeles: J. Paul Getty Museum, 2010), p. 225.